From our humble beginning, we have evolved into a professional group of outstanding business and technology consultants. 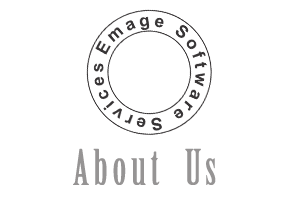 Emage Software Services is an IT services company that offers a one stop shop for a very unique combination of services. Our services range from Business Consulting, Technology Solutions to IT Staff Augmentation. At Emage we are committed in supporting business organizations to implement sustained processes and technologies for helping them become competitive and profitable. We focus in helping business organizations achieve continued growth through innovative business processes and technology solutions. Emage leads the way in implementing and managing technology by partnering with industry leaders to expand our capabilities and increase the value to our customers. We focus on process and technology integration services for business applications, hardware systems, business datawarehouse, business intelligence, system QA, enterprise portal solutions, content management systems, outsourcing services for application development & enhancement services with local, national and international capabilities and staffing services to support human capital management needs. At Emage we provide dynamic solutions where business and technology strategies join. We focus on delivering innovative business methodologies that combine IT innovation and adoption by leveraging and enhancing the organization's existing IT & human assets. At Emage our mission is to constantly provide and implement creative and cost effective IT solutions that transform your business needs into agile technology solutions, while meeting and beating expectations of cost and timeliness. By channeling knowledge and value, coupled with our commitment to quality IT services.